Preston Nomads are five points clear at the top of the Sussex Premier League after beating Bexhill by a massive 177 runs. Batting first, Nomads had Dan Phillips (83), Carl Simon (61) and Robert Wakeford (53no) to thank for taking them to 268 for nine. Bexhill were never in with a chance in their reply and were all out for 91. Only Johnathan Haffenden (38) put up any resistance while Simon was the bowling hero with six for 33. Roffey are second after a win at Eastbourne. The hosts were all out for 153 and Roffey reached the target with five wickets down. 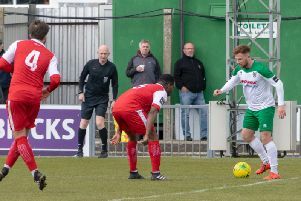 Brighton’s title challenge was dented by a home loss to Billingshurst. Dhanushka Mitipolaarachchi’s remarkable spell of seven for 16 from 10.1 overs saw Brighton all out for 97 and it was easy for Billingshurst in reply, as the bowling hero’s 48 not out and 36 from Scott Stratton got them over the line in 13 overs for an eight-wicket win. Cuckfield are fourth following a draw at East Grinstead, where William Adkin top-scored for the hosts with 83 in a total of 221. Ian Sturmer took three for 41 in the Cuckfield reply but they held out at 153 for nine to deny EG. Horsham beat Middleton in the battle between two sides who have had tough starts to the season. A century from skipper Sean Heather (114) carried Middleton to 208 although he was short of anyone to stay with him for long - incredibly Michael Munday took the final eight wickets to fall. Tom Johnson showed anything Heather could do, he could too as he struck 108 to help Horsham to a four-wicket win which leaves Middleton still looking for their first win following promotion from division two. In the second division, Pagham are top of the tree thanks to a fine win at Crowhurst Park. Nabib Rahman’s five for 35 saw Crowhurst shot out for 132 before an unbeaten century stand between Stuart Hanks (59) and Ryan Barratt (45) earned a nine-wicket win. Three Bridges won at Findon and are second, 17 points behind the leaders. Matt Blandford took six for 38 to bowl Findon out for 133, while Three Bridges openers Hugo Cowan and James Chadburn put on 99 to put them well on their way to a six-wicket triumph. A knock of 91 by Harry Finch set Hastings and St Leonards up for a winning total of 267 for seven. It was too much for St James Montefiore, who were all out for 173 as Adam Barton ripped through the batting with six for 26. Lindfield were victorious in the mid-table clash at home to Worthing. Tom Howard (95) and Simon Shivnarain (82) enabled Lindfield to declare on 287 for three, while Worthing battledwell only to finish 220 all out. Josh Wood (59) was their top batter. Ansty improved their position near the bottom with a win over Ifield. Jethro Menzies took seven for 27 as Ifieldwere skittled out for 77 and Menzies was just as dominant with the bat, hitting 44 as Ansty for home by eight wickets. Bognor are sitting pretty at the top of division three after a 115-run at Portslade. Burgess Hill remain second after defeating Chichester Priory, while there were also wins for Goring against Haywards Heath and Steyning over Glynde and Beddingham. The game between Rottingdean and Crawley Eagles ended in a draw. Division four is led by Slinfold, who have taken the maximum 30 points from each of their first five games, Rye their latest victims as they won by five wickets. Mayfield stay hot on their heels after their fourth win from five, versus Keymer and Hassocks, and there were also victories for Stirlands over Southwater and Henfield over Hellingly. The only draw was between Crawley and Wisborough Green.